Fin Bartels is happy to be back in training with the rest of the team (Photo: nordphoto). Fin Bartels is beaming. On Tuesday afternoon, he’ll train with the rest of the squad again. It’s not the first time, and it won’t be the final time. 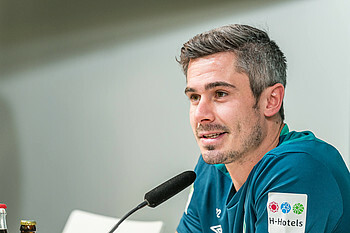 Bartels is back and could soon play in the Bundesliga again after 14 months out due to injury. “This week is a really hard test,” said Bartels, who completed his first training session back with the team last week. He’s getting over his achilles injury that he suffered in December 2017, but Bartels suffered more setbacks than that. He calls them “linked injuries” or just places on your body that have become weaker, for example in the back or knee. Again and again, these minor injuries delayed Bartels’ return to the rest of the team, like in the training camp in South Africa. Fin Bartels is expecting to complete his comeback soon (Photo: nordphoto). “I noticed at that time that I needed to take on less at first. It’s looking significantly better this time around. I’m looking forward and I’m optimistic that it’ll all come together this time,” said Bartels. No setbacks, no unwanted reactions from his body, no new injuries. Up to yet. “I have to listen to my body and not get carried away. I can put 100% into the things that I do in training, but I can’t do everything yet, so we’ll see how my body reacts to the stress,” said Bartels. There’s now a lot more competition for attacking places than when Bartels played his last game for Werder. Milot Rashica, Yuya Osako, Johannes Eggestein and Josh Sargent have all shown their quality in recent weeks. “We’re all glad that the boys have been doing so well recently. Firstly I want to get fit, then I’ll become a challenger. That’s the motivation for me,” said Bartels. In order to get back to his former level, it’s being debated whether he could play for Werder U23s in the Regionalliga. “That’s possible, in order to get so match practice,” said Bartels. Even though the quality of the fourth division can’t be compared to the Bundesliga, it will help the forward with intensity. After that, Werder fans could be seeing Bartels back on the Weserstadion pitch.